The safe alternative to cloudy, breakable sight glasses. High Visibility – Brilliantly colored flags are easy to read, even at great distances. The indicator is isolated from the measure media; therefore, Suresites can be used where sight glasses are not even a consideration. Durability – Stainless steel, PVC, CPVC, PVDF, Hastelloy or other exotic housings, whatever the media requirements, provide years of maintenance-free service. Environmentally Safe – Monitored liquid is contained inside a pressure-tight housing. Efficient – Continuous level indication without external power. Electronic Control – Attach optional level switches and/or continuous level transmitters to extend capabilities beyond those of a simple sight glass. As liquid level rises, a magnet-equipped float within the unit inverts the magnetic flags in the external indicator to “color-side-out.” The flags remain magnetically interlocked in a column until again inverted to “contrasting-side-out” by the float as liquid level falls. Liquid level is indicated by the junction of the “color” and “contrasting” portions of the column. It begins with a patented Flag Assembly and integrated Magnetic Guide. Many Magnetic flag type indicators look the same, but look closer and you’ll see they are not made the same. SureSite® Indicators are unique. 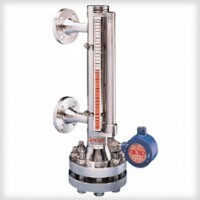 They incorporate a patented design and special features that provide the ultimate in performance and reliable operation. A permanent magnet, encapsulated into each flag, forms a secure magnetic interlock with adjacent flags. Proper alignment is assured, and is unaffected by shock, vibration, surges, or rapid level changes. A Magnetic Guide (a SureSite exclusive) enables the use of a more powerful bar magnet in the float assembly. The guide is integrated into the flag channel, so regardless of positioning, the bar magnet within the float is always aligned for optimum performance and exactness. A powerful, permanent bar magnet lies in a horizontal position within the float. This preferred attitude directs the flux density of the magnetic field toward the flags. Flag rotation is positive and reliable. Float capability to handle liquid specific gravity range as low as 0.40. Brilliantly colored flags are easy to read, even at great distances. The indicator is isolated from the measure media; therefore, Suresites can be used where sight glasses are not even a consideration. Stainless steel, PVC, CPVC, PVDF, Hastelloy or other exotic housings, whatever the media requirements, provide years of maintenance-free service. Monitored liquid is contained inside a pressure-tight housing. Attach optional level switches and/or continuous level transmitters to extend capabilities beyond those of a simple sight glass.